Conlan, High prince of Atlantis, comes home after seven years of being held prisoner by the Goddess of the Vampires. The water portal, a being of its own magic, answered his call and dumped him – literally – home in front of a known guard. Riley Dawson is a human, a social worker, an empath, she knows vampires and shifters exist, they announced themselves about ten years ago, now are taking over the human governments – getting their own House in the American Congress. She’s had a very bad day, so the beach calls her for a walk. Trouble finds her again, but this time their is a six foot plus warrior to save her. Their minds connect, maybe even their souls, and she sees only beauty and pain. This is the start of the love of these two, a young human empath that is to take on the very God of the Seas and Oceans, to become queen. Is she strong enough to withstand the shifters and vampires that line up between her and her happy ending? 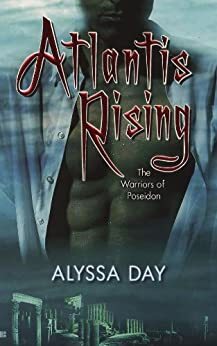 When they take down her protective Warriors, and she goes against their God to get them back, can she survive the anger of the most powerful Greek Gods? A family secret, her twin sister’s life in danger, will this prevent her from going below the ocean? A beautifully woven woven tale that take you to this new world Ms. Day has created. Immerse yourself in the waters of the Warriors of Poseidon, you will never want to leave this five star world.